RANTPARROT - I GET CROSS A LOT: X-RATEDBOX - WELL WHAT THE FFFFFKT IS THAT FOR? SO I was helping the older boy move the Xbox from the sitting room to the spare room as that way I could watch football without a surly hormonal teenager hurumphing through an affected sigh in the corner. I say helping. I was in fact moving the Xbox from the sitting room to the spare room while trying not to attack him with an assortment of adaptors. His interventions were magnificently mistimed and twitchingly wrong. It's busy down there. There the Xbox with lots of wires. 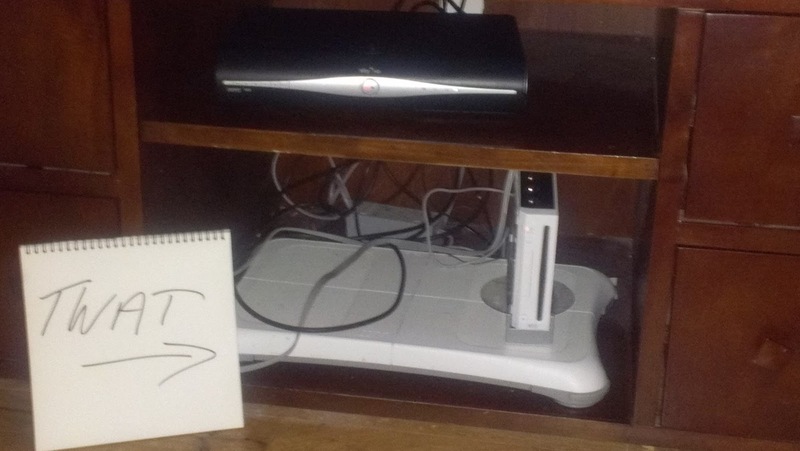 There’s a Wii down there below the TV with more wires than makes sense. There’s a Sky box with even more wires and a Wii fit thing that none of us understand but at least it has no wires. I started with the wires as my apprentice twitched and moved a thing he called a scart adaptor around in front of the TV, just in the periphery of my vision and close enough to have me wanting to cut his fingers off. My apprentice grinned a nervous smile and said: “Erm.” He knew where this was heading already. We managed to untangle a set of wires that smelt right and that was enough for me as I had started to sweat and blink a lot, and tellingly, I was stretching my shoulder blades and neck forward in that way that says to the wise watcher that something is about to blow. Then the Sky box shelf fell down as I tugged at one belligerent wire that was pretty adamant it was going nowhere. I know it was unreasonable but I was dealing with a slouching teenager with all the intuition and get up and go of a distracted sloth. Now I swear from time to time, especially at work where it makes me look cool. But I do not like swearing in front of the children so I don’t. But now normal language was inadequate. The Wii started laughing at me as we debated the merits of the final wire I thought I needed. The Wii was right, it belonged to something else, neither of us had a clue what. You cannot put a teenager on the naughty step as he just takes his iPod with him and a naughty spike seems too severe so I just had to grimace and make sly comments about his hair while planning to eat his iPod. 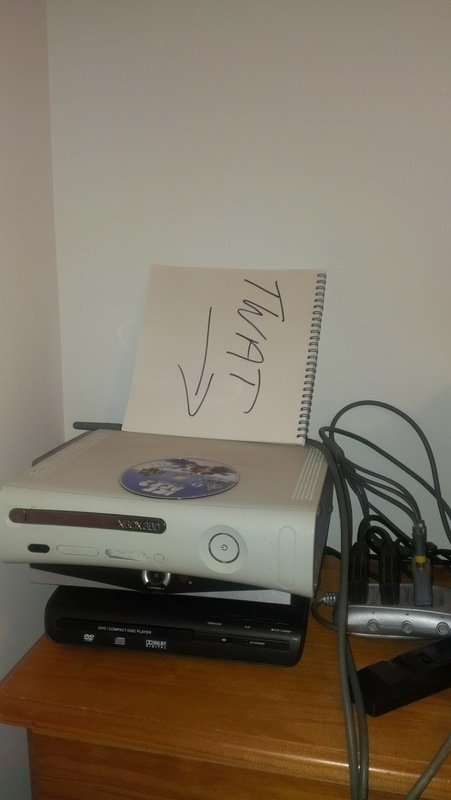 We managed to get the Xbox into the spare room. It was not truly successful as I panting and could no longer see because the sweat was pouring off me. It had dribbled down my forehead and was gathering in little pools in my eyes. I looked like a tearful gibbon having an asthma attack. On the upside, I even managed to get it plugged in in its new venue and wired up like some proper dad. Off he went to play some teenage nonsense. I gave up playing some time ago after I put my shoulder out using my torso and not my thumbs to execute some imaginary top spin on an impossible passing shot in an unrealistic tennis game. Once you realise you are over 40 and only your thumbs work, you quickly realise there is no point as you need more fingers and patience than is reasonable. I went back to the TV to plug the Wii back in and make sure the Sky box was working. No. I was alone. I eat some jelly babies with a cola bottle chaser. I swore and threatened wires, plugs and even the coffee table that had decided I was in its way. Oh I swore. There is something deeply soothing about swearing at stuff. Any stuff. All stuff. I invented new swear words, joined them together to make the most insulting and satisfying concoctions. I imagined kicking the crap out of the Wii in the back garden while slugs cheered me on and sparrows looked on disapprovingly. It was bliss. I needed to sit down. I needed to cut back on the jelly babies. And after another 15 minutes the TV was working again. The Wii can FFFFFFKing wait, smug piece of crap. That’ll show it. I sat down, there was 10 minutes to go in the match. That was time well FFFFking spent. I have no idea who I am cross with but something is getting it. I had won, this much was true, but at what cost? My teenage son is not sure what species I am and is heading to school tomorrow thinking for FFFFFFFKS sake is a swear word. There’s an internet dongle thing plugged into the back of the Xbox. None of us have been able to make it work but I am told it is wireless. I then found a piece of important looking plastic and spent 10 minutes trying to figure out what it had fallen off. It was Lego, Lego that is now dead, burnt to a crisp in an offering to the Wire Gods. Parenting does not get much tougher than this.